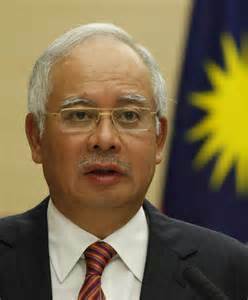 MH370 – Malaysian PM Speaks Out | Words, By George! “The disappearance of the Malaysia Airlines Boeing 777 flight on March 8 has been one of the most extraordinary events ever to befall Malaysia – and one of the world’s greatest aviation mysteries,” Mr Najib said. Mr Najib said one of the most astonishing things about the tragedy is the revelation that an airliner the size of a Boeing 777 could vanish, almost without trace. “In an age of smartphones and mobile internet, real-time tracking of commercial airplanes is long overdue,” he said. Mr Najib, writing in the Wall Street Journal, urged the International Civil Aviation Organisation, which has been meeting in Montreal, to act on a Malaysian recommendation to implement real-time tracking of aircraft. He said the communication systems on aircraft such as transponders and the Aircraft Communications Addressing and Reporting Systems (ACARS) should be changed so they cannot be disabled mid-air. He said that policy makers need to reconsider the capabilities of airliners’ black box recording devices. “At the moment, the location pingers – which are activated if a plane crashes – last for only 30 days. This should be increased to at least 90 days, as the European Union has proposed,” he said. Mr Najib said it was “wholly inadequate” that today’s black boxes only record the last two hours of cockpit conversations, meaning the important minutes and hours after the plane vanished will not be available. “Given that a standard iPhone can record 24 hours of audio (Unlikely, Ed,), surely the black box should have sufficient memory to record cockpit conversations for the full duration of any flight,” he said. Mr Najib also said that airliners’ emergency locator transmitters – which emit a distress signal when the plane is in trouble – could be improved. Mr Najib said the aviation industry failed to implement changes after Air France flight 447 crashed into the Atlantic Ocean in 2009 and the changes need to be made to help reassure the travelling public and reduce the chances of such a drawn-out disaster reoccurring. He said experts have identified that MH370 ended in the southern Indian Ocean, discounting dozens of other theories and reported sightings. “Yet, despite the efforts of the world’s brightest minds and best militaries, the search area remains huge,” he said. Mr Najib said without physical evidence or a clear explanation for what happened, people’s attentions turned to the authorities – and Malaysia has borne the brunt of the criticism. But he said in the passage of time he believes Malaysia will be credited for doing its best under near-impossible circumstances that involved overcoming diplomatic and military sensitivities to bring together 26 countries to conduct one of the world’s largest peacetime operations. But Mr Najib said the plane vanished at a moment between the air-traffic controls of Malaysia and Vietnam, causing maximum confusion. “Nevertheless, the response time should and will be investigated,” he said. Mr Najib said none of this could have altered MH370’s fate. “Instead of heading to Beijing, the plane made a sharp turn across Peninsula Malaysia, travelled north up the Straits of Malacca, made a U-turn over the coast of Sumatra and ended in the southern Indian Ocean,” he said. Mr Najib said the lack of definite proof – such as wreckage from the plane – has made the disappearance more difficult to bear for the families of those on board. “I pledge that Malaysia will keep searching for the plane as long as it takes,” he said.